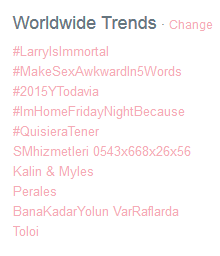 #LarryIsImmortal is trending 1st worldwide. It's reassuring that so many people still ships Larry, but yet i can't help to think that it might provoke M!M to further seperate Harry and Louis. I don't Know. Hmm. I think the quote Mike Adam wrote in combination with the fact that he then retweeted a Larry shipper that answered that exact quote could maybe mean that the original tweet is referring to the Elounor + Harry and Nadine pictures that have emerged in these last couple of days. 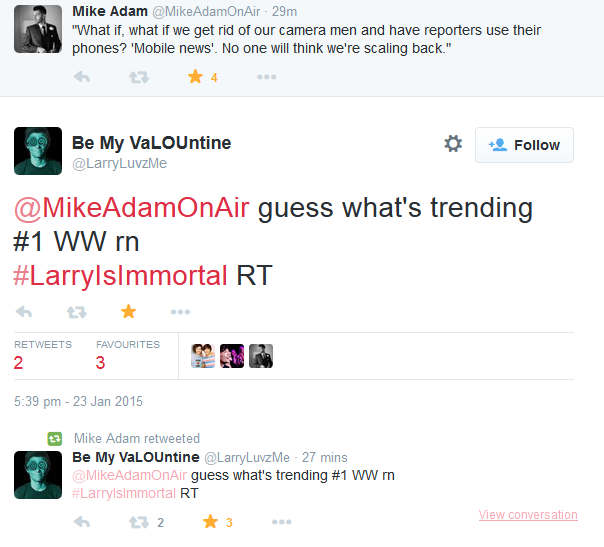 Mike Adam openly ships Larry, and have talked to Larry fans before, so it wouldn't surprise me if he'd cuaght up on the whole bearding-picture thing. Just a thought.